A mole or a nevus is a black or brown growth on the skin. Moles are very common; in fact, most people have 10-40 moles on their skin before age 25. The vast majority of moles are completely harmless. However, if a mole displays certain symptoms, it may have developed into melanoma, or skin cancer. In this case, the mole should be immediately removed. What are the characteristics and causes of moles? Moles first appear in childhood, though certain types of moles, called congenital nevi, are present at birth. They typically change slowly over the years, changing color, becoming raised, or disappearing entirely. Moles are clusters of melanocytes, the cell that contains the protein melanin that gives your skin its color. Generally, melanocytes are distributed evenly throughout the skin, though when a patch of skin contains a larger-than-normal concentration of melanocytes, it becomes a mole. 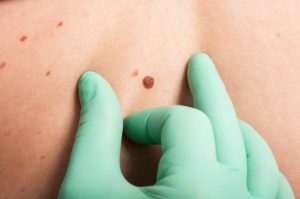 When is a mole a sign of skin cancer? Asymmetry. Benign moles are symmetrical, while cancerous moles are asymmetrical. Border. Benign moles have clearly defined borders, while cancerous moles have irregular, blurred, or ragged borders. Color. Benign moles have a uniform color, while cancerous moles have variations in color, with shades of brown, tan, blue, black, red, or white. Diameter. Healthy moles should be no larger than a pencil eraser. Evolution. Is the mole changing in shape, size, or color? If a mole displays any of these signs, have it checked by a dermatologist immediately. Depending on the mole’s size and location, it can be removed either through shaving or excision. Small moles can simply be shaved off. The surgeon will apply a local anesthetic and move a scalpel flush with your skin, cutting off the mole. A bandage is applied and the wound will heal like a normal cut or bruise, with no stitches required. Surgical excision is used on moles suspected of being cancerous, or moles in highly visible areas where scarring should be reduced. If the mole is cancerous, your surgeon will remove the mole plus a surrounding area of skin to ensure the mole is completely excised. This type of mole removal requires stitches. What are the costs and insurance coverage for removing a mole? Most frequently, excision of moles is covered by your health insurance. However, if you don’t have health insurance, shaving a mole generally costs between $250-500, while surgical excision costs $500-1000. Moles are usually removed only when they have become cancerous. In this case, mole removal is considered a medical necessity and should be covered by insurance. If you are removing a mole for purely aesthetic reasons, that operation will likely not be covered. For any questions related to insurance coverage, Beverly Hills Plastic Surgery Group will be more than happy to walk you through the process.